I’m a big fan of eggs. I think they’re great for any meal. 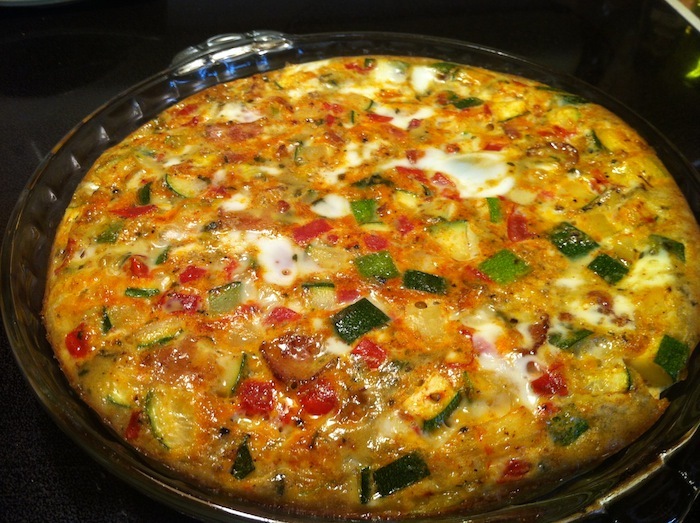 I recently whipped up this frittata for my dad’s retreat. It’s easy to make ahead and is easy to customize for whatever your dietary needs might be. Preheat oven to 350°F. Grease a 9″ pie pan with cooking spray and set aside. In a large skillet, fry bacon. When crispy, set aside on a paper towel to removed excess grease. Carefully wipe off most of the grease from the pan, then sauté zucchini and tomatoes until tender. Spread vegetables out in greased pie pan. Top with crumbled bacon. In a large measuring cup whisk together eggs, salt and pepper. When vegetables and bacon are cool, poor egg mixture over the top. Place in the oven and bake for 30-40 minutes, until golden on top and eggs have set in the center.